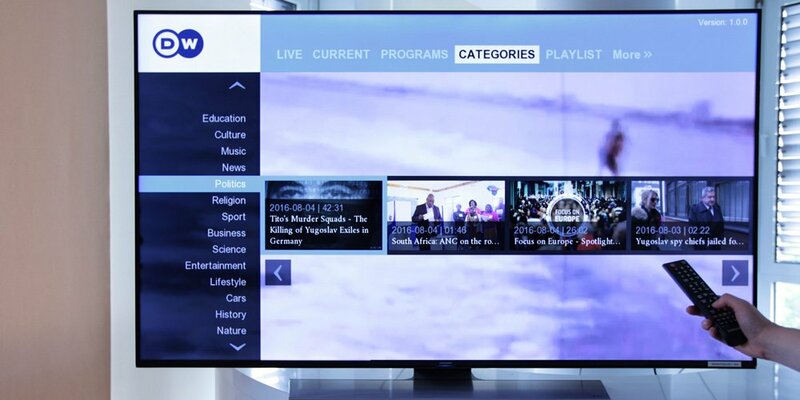 German broadcaster Deutsche Welle launched a Smart TV App developed by Fraunhofer FOKUS. The FAME Lab provided different testing devices for implementation and quality assurance. The app is compatible with LG and Samsung TVs. Fraunhofer FOKUS developed a SmartTV App for German broadcaster Deutsche Welle. The app was based on consisting design supplies and implemented for LG and Samsung TVs. For implementation and quality assurance the FAME Smart TV Lab provided different testing devices. The development started in September 2015 and focused on platforms produced from 2013 on. These platforms include SmartTV SDK, Samsung Tizen, LG NetCast (Smart TV Alliance), LG WebOS 1 and LG WebOS 2. The app is available in German, English and Spanish.